Police authorities in Monrovia have disclosed that a joint operation with officials of the Liberia Electricity Corporation (LEC) has led to the arrest of a 30 - year - old man only identified as Quincy H. Boley for allegedly duplicating LEC original flag receipt. Police told a press briefing Monday, 2 July in Monrovia that the accused allegedly gave the duplicated receipt to LEC’s customers. 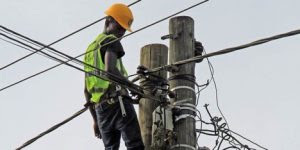 In a joint press conference Monday, LEC Communication Manager Winston Bedell said with the joint efforts of the LNP and LEC, they caught the doer behind LEC’s lose of huge amount of money due to power theft. Mr. Bedell says few months ago in their efforts to address issues that some customers had with their meters, LEC brought in in a flat rate payment scheme, a measure he says was designed to address customers’ problems. According to Mr. Bedell, LEC management noticed that people who were on the flat rate were not returning to the corporation to make payments. Instead, he says every time officials went out in the field, they met new invoices, thus raising huge suspicion. According to Mr. Bedell, such incident has been taking place for a long period before it claimed the attention of LEC management.On Friday, 29 June, he says LEC officials and the LNP arrested suspect Boley, accusing the suspect of causing LEC to lost about 61% to power theft, 49% commercial loses, and 12% technical loses. He warns that those that are involved in these acts must stop because there will be a crack down on power theft.Also giving updates on police’s operation in the country, Police Spokesman Moses Carter said police in conjunction with the LEC obtained a writ of search and seizure on Friday at 2:22pm and subsequently arrested suspect Boley for allegedly duplicating LEC flag receipt at the Morris Community on Clay Street. According to Mr. Carter, the suspect has been forwarded to court for prosecution.Mr. Carter sends out a warning to the public, especially those that are involved with power theft, saying they will face the full weight of the law.